It’s that time of the year again that we get to celebrate the Fourth of July in the River city! The great thing about living in Jacksonville, is there is a ton of things to do and see for the Fourth including FIREWORKS!!! Here are some of the best places to view fireworks in Jacksonville. Fourth of July in Jacksonville- Fireworks! Downtown Jacksonville– Starting at 5pm, the Landing will be hosting live music, drink specials, and great fireworks over the St Johns River. The fireworks can be seen best anywhere along the river and Friendship fountain. Beaches– Pack a chair, blanket, and head to the beach! Fireworks can be seen at all points of Jacksonville Beach and allow for an unobstructed view of the night sky. If you can get down there early enough, grab dinner or a drink on the patio at the Pier Restaurant and watch from there. World Golf Village– If you want to celebrate a little early and see some amazing fireworks, then World Golf Village is where you want to be! Fireworks are on July 3rd and he show starts at 9:15pm and will have food and drink vendors to provide refreshments. Parking can be a hassle so get there early to save your spot. There you have it! 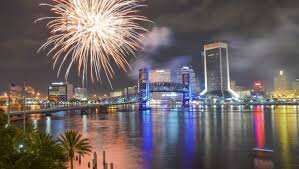 No matter what side of town you will be celebrating the Fourth on, you can surely find some fireworks to cap off the Fourth of July in Jacksonville!